Introduction: The eighteenth century India is documented as one of the most turbulent phases in history where one can find power brokers controlling the Imperial authority at Delhi. The Nawabs of Oudh, Marathas, Afghans, and British East India Company were main ruling forces in North India (Hindustan) that were fighting with each other to regain the control over titular Mughal Kings of “Qila-e-Moalla” in Delhi (Red Fort). On 23 April 1774 AD, after the final defeat of Rohilla Afghans by joint forces of British East India Company and Nawab of Oudh, led by Colonel Champion and Shuja-ud-daula, the princely state of Rampur was came in existence. Nawab Faizullah Khan retreated with his army in foothills of the Himalayas known as Lal Dhang after the death of Rohilla chief, Hafiz Rahmat Khan in the battlefield. After a guerilla war of five months, it was on 7 October 1774 AD, the joined forces of East India Company and Nawab Oudh opened the talk with retreated Rohilla armies in Lal Dhang. This resulted in the creation of the princely state of Rampur and Nawab Oudh occupation over the vast Rohilla territories in Katehar. History documented this agreement between Nawab Shuja-ud-daula and Nawab Faizullah Khan as the treaty of Lal Dhang. Nawab Faizullah Khan was considered as founder and first ruler of the princely state and it continued as an independent state until the freedom of India on 15 August 1947 AD.The Mughal Empire loses its central control and regional powers exert a greater influence. Even though the imperial power has lost but history witnessed symbolic regard and respect for Mughals from Marathas, Rohillas, and East India Company up to the time of last Emperor Bahadur Shah Zafar. One can find sporadic incidents of humiliation for example; insane Ghulam Qadir Rohilla, the unworthy grandson of Rohilla leader Najib Ud Daula, showed an act of barbarism toward the descendants of Babur and Akbar. Translation of the narration: While reading an oriental text on Rohilla history titled as “Akhbar US Sanadid” Vol 1, by Hakim Maulvi Mohammad Najmul Ghani Khan Najmi, I found a narration that reflected the etiquettes and respect delivered by Nawab Faizullah Khan towards the Royal Princes from the house of Babur in the reign of Shah Alam II. “Mirza Jawan Bakht who was in charge of the affairs at Delhi in absence of Shah Alam left “Qila-e-Moalla” on 1198 Hijri (1784 CE) for traveling to Lucknow. When they reached Rampur, Nawab Syed Faizullah Khan offered Nazr, gifts and completed the rituals of hospitality with great pomp and show. On Tuesday, Jamadiul Akhir, 26, 1198 Hijri (corresponds to 17 May 1784 CE), the royal caravan of Shah Alam, with two princes, Mirza Javan Bakht and Mirza Sulaiman Shikoh left Delhi and reached Moradabad. In evening, Syed Faizullah Khan came to know about the arrival of Royal Caravan in Moradabad. In morning, the caravan of Mughal princes moved towards Rampur. Nawab Sahib received the Royal Princes at a distance of four miles from Rampur on the road to Muradabad. With all respect, the Mughal princes were brought to the fort of Rampur. Cash, essential commodities, elephant, horses, weapons, and tents were presented to them. In anecdotes of Shah Alam, these items were described in details. It was written that Nawab Faizullah Khan, the In charge of Rampur gifted two thousand Rupees, two Elephants, few horses, and many camps were presented to the royal princes. The Mughal princes stayed in Rampur for four days. On Friday, they offered congregational Friday prayers in Jama Masjid of Rampur. Mirza Jawan Bakht presented “Khillat” (a customary gift presented by the rulers) to the speaker of the mosque. With the intent of leaving, the prince mounted on his horse and caravan moved towards Bareilly. Nawab Faizullah Khan escorted the princes along with his sons and chiefs of the state. He escorted them up to the place where the tent of the Royal Princes was fixed. The royal food prepared with a variety of dishes was sent to the camp of Mirza Jawan Bakht and his fellow travelers by Umar Khan alias big mustache. Mizra Jawan Bakht sent a “khillat” for Nawab Sahab through Umar Khan. Mirza Jawan Bakht also gifted a turban and Shawl was gifted to Umar Khan. In morning, the royal caravan started to move towards Bareilly, the next station on the way to Lucknow“(Akhbar Us Sanadid). Description of Mirza Jawan Bakht: The prince described above in the narration was the eldest son of Shah Alam II. As an heir apparent, he was responsible for running the affairs of “Qila-e-Moalla” in the long confinement of his father in Allahabad fort after the battle of Buxar. The oriental biographical dictionary of Beale and Keene (1894) mentioned the arrival date of Prince Jahandar Shah (titular name of Mirza Jawan Bakht) at Lucknow as April 1784 CE. The difference might appear due to the conversion of Hijri date to Gregorian from primary sources. The crown prince escape to Lucknow was intended primarily to hold talks with Warren Hastings and Nawab Oudh for rescuing the seat of Delhi from the Maratha control. The call of the prince was put on hold as both parties didn’t want to engage in direct confrontation with Sindhia who was in charge of the affairs at Qilla e Mulla. 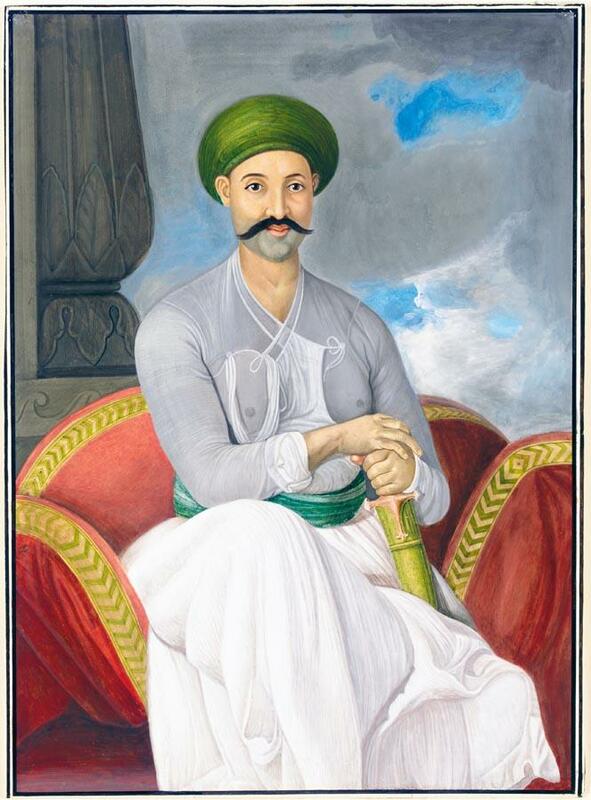 As a crown prince and symbolic authority from the house of Timur, the Governor General issued an order to keep the prince in his own camp away from the Sindhia at Lucknow. A generous stipend of five lakh per annum and an accommodation according to his rank was provided to the prince at Lucknow. In initial days of his stay at Oudh, the crown prince developed a close relationship with Asifuddaula but the relationship got strained in the coming years, which forced the prince to shift his accommodation at Benares. In Benares, Mr. Hastings provided him an accommodation and monthly stipend of twenty-five thousand rupees from Nawab Oudh. The unfortunate prince passed away in Benares on 25th Shaban, 1202 AH (1 June 1788 AD) and buried with Royal traditions close to the tomb of the venerated Muslim saint. All the principal citizens and British resident of Benares attended the funeral of the Jawan Bakht. Prince Jawan Bakht died at an early age of thirty-nine years in efforts to save the seat of his ancestors in the backdrop of late 18th-century factional politics of Hindustan. The Governor-General Warren Hastings himself wrote about the prince as “gentle, lively, possessed of a high sense of humour, of a sound judgement, an uncommonly quick penetration, and a well-cultivated understanding, with a spirit of resignation and an equality of temper almost exceeding any within reach of my own knowledge or recollection“. Jawan Bakht left behind an account titled “Biyaz Inayat Murshidzada”. He was an excellent poet of “Rekhta”. The paintings of Prince that was attributed to Charles Smith, a celebrated Scottish painter and letters published in Proceedings of Indian History Congress by Kali Kinkar Datta (1949 AD) reflected the position although only symbolic held by the Prince Jawan Bakht as a crown prince from the house of Babur among the British administration. The hospitality of Faizullah Khan towards the Royal caravan as narrated by Ghani was the customary tradition followed by all the princely states of Hindustan. The symbolic generosity of British and other regional power towards the house of Timur and Babur finally ended with fall of Delhi in 1857 AD. The destiny forced to join the last Mughal emperor as the leader of mutineers marked the end of the dynasty but recorded the name of Bahadur Shah Zafar as the leader of first freedom movement of British India.The recitation of the couplet by an aged Emperor after the defeat reflected the similar valor of his ancestors and love for his homeland. The sword of Hindustan shall flash from here till the throne of London (Translation by Rana Safvi, 2015). Nazr: A customary gift offered to Indian princes and Royals in the days of Mughal India. Khillat: Honorary robe or any gift offered by the Imperial government. Rekhta: A form of Urdu dialect. The rekhta style poetry was famous in 17 and 18th century. Qila-e-Moalla: It means fort of exalted dignity. A term used for the Red Fort in the 18th and 19th century. Najmul Ghani Khan Najmi Rampuri, Akhbaar-US-Sanadid, (Maktba Munshi Nawal Kishore(Lucknow), Urdu, 1918). Republished by Raza Library Rampur, 1997. Datta, Kali Kinkar. “CALCUTTA-OUDH CORRESPONDENCE RELATING TO JAHANDAR SHAH, 1788 AD.” Proceedings of the Indian History Congress. Vol. 12. Indian History Congress, 1949. Beale, Thomas William, and Henry George Keene. An Oriental Biographical Dictionary: Founded on Materials Collected by the Late Thomas William Beale. WH Allen, 1894. Rehan bhai great for writing the details of glorious history of India Awadh region from original sources.